One of the lesser-known industries in which Filipinos dominate globally is the seafaring industry. According to this GMA News article, the Philippines accounts for 28% of the world’s shipping crew with about 250,000 officers and crew members. In a distant second is the whole Indian subcontinent which only has 100,000 people employed in the industry. Filipinos so dominate the crew members of the world’s ships that whenever a ship or tanker anywhere capsizes or is overrun by pirates, expect that Filipinos will be affected. In addition, Filipino seafarers remit about $1 billion to the country, annually. Future projections indicate that there will be a big rise in demand for seafarers and the Philippines is trying to keep up with the demand. Among the more than 100 schools in the country that offer degrees in B.S. Marine Transportation or B.S. Marine Engineering, it is the Philippine Merchant Marine Academy (PMMA), whose campus is located in San Narciso, Zambales, is I think the most reputable in the country. This 188-year-old institution was created by a Spanish Royal Decree on January 1, 1820 and was named the Escuela Nautica de Manila with its campus inside Intramuros in Manila. The American colonial government renamed it as the Nautical School of the Philippine Islands and then as the Philippine Nautical School before gaining its present name under Republic Act No. 3680 in 1963. Interestingly, despite being a school that produces graduates mostly hired in the private sector, the PMMA has a military-style education reminiscent of the Philippine Military Academy. Because of this, PMMA graduates are often directly hired as ship officers in commercial vessels and are automatic reserve officers in the Philippine Navy and the Philippine Coast Guard. But all is not well in this maritime educational institution. The biggest blow to PMMA’s reputation was when it failed the Commission on Higher Education’s 2001 accreditation of the 1995 International Convention on Seafarers’ Standards of Training, Certification and Watchkeeping (STCW ’95) (see news article). The PMMA has since undergone efforts, with the help of the alumni association, to improve the standing of the Academy. To learn more about the PMMA and view a ton of pictures, see the Wikipedia article. And to read more about the Filipino seafarers, read this 4-year-old PCIJ feature article. I have been reading most of the comments inquiring about the PMMA. Just as a brief note, PMMA is one of 4 government service Academies in the Philippines (Philippine Military Academy, Philippine Merchant Marine Academy, Philippine National Police Academy, and Philippine Air Force Flying School). All students of these Academies mentioned are scholars and fully subsidized by the Government of the Philippines. Admission requirements are strict, and candidates must undergo several screening process before being appointed as a Midshipman. 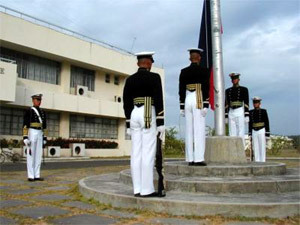 PMMA has a quasi-military structure of curriculum and training, and Midshipmen are required to live in campus during their stint in the Academy. The PMMA offers four year residency that leads to Bachelor of Science degrees in Marine Transportation and Marine Engineering. Graduates of the Academy are Automatically commissioned as Ensigns in the Philippine Navy and Philippine Coast Guard, and Licensed as Merchant Marine officers that assures employment after graduation as Merchant Marine Officers or Naval Officers. For more information, please visit PMMA website at www.pmma.edu.ph. how much is the tution fee of th B.S marine transportation to your school? please give me the complete details about PMA.thank you so much. Hi, I am India into the business of education abroad, I get a lot of enquiries about merchant studies abroad, If you any programmes to be offered for indian students pleae reply. What are the qualifications of applicants? I have read some profile of your school and we congratulate you being one of the best marine school in out country. I am a mother of my graduating son this March 2011 and the only one sending them to school. My son wants to enrol in your school after his graduation. In view thereof, I am interested to ask how will he apply to your school in order for my son to know what he will do after graduation. @ jerson:no tuition fee at PMMA, stay in so no need for board and lodging and also the food. My nephew is graduating this year. He is interested in Marine Engineering field. Your school has a very good reputation and I believe he will be a good candidate. Please let me know of what your requirements, entrance exams, academic qualification for him to get accepted. sir, does PMMA accept late enrollees? I would like to enroll this coming school year but it seems that the entrance exam had already concluded last september 2010. Can I still take the exam this month? sir, is it true that we need to pay 20k for the uniform? and another payment for medicals? not including the payment for entrance examination.. thank you sir. 1. The entrance exam sched nd requirements. My son is very much interested to enter PMMA. He will turn 16 y.o. by january 2012, and will soon be graduating from high school on march 2012. will he qualify for the PMMA Entrance examination? and when will be the scheduled entrance exam? I Amante Tayaban is very much interested to enter PMMA. I am now 17 y.o. this coming Nov. 25 2011 and will soon be graduating from high school on march 2012. Can I know the PMMA Entrance examination? and when will be the scheduled entrance exam? Im a fresh graduate of my High School sy 2011-2012 and im interested in PMA, when we will be the schedule of entrance exam? gud pm po sir & man nais ko pong makapag aral sa inyong pa-aralan 5.ft/3.inch, po ako, ma-aare po ba akong makapasok sa inyong school pangarap ko pong makapag aral sa inyong school marameng salamat po gud bless. . . .? sir and ma’am , nais ko po sanang makapag aral sa inyong paaralan , maari po bang makakuha ng entrace exam saan po ba ang mga outlet na malapit dito po sa manila para makapag take ng exam ? dahil gusto ko po talga makapag aral sa inyong paaralan. ako po ay may taas na 5’6 at highschool graduate po ako at may idad na 16 yr old . maari po bang malaman kung paano po makakakuha ng entrace exam ? kailan po ba makakakuha ng entrance exam ngayong 2012 . gusto ko po sanang makakuha ng BS MARINE ENGEENIRING upang makatulong po sa aking magulang dahil hindi na nila kaya ang pag papaaral sa akin . maraming maraming salamat po . encarnacionvonjovie@yahoo.com yahoomail ko po yan . maraming salamat po ulit. god bless . good morning maam/sir! i am currently 4th year high school student SY 2012-2013, i just want to know the date and place where examination be held this year 2012? hoping for your response to my request? thank You and Good Day!! sir/mam.. pwd po bang mlaman kung meun babyadan sa pmma o wla.. at gusto ko pong magaral jan e. oh kya kontakn neu nlng po ako eto po cp number ko 09161608172 .. slmat po..
Sir what if the philippine will be taken off from white list of IMO?? even Pmma will be affected?? Pano po yon mgaaral lng ako sa wala?? Sa lahat po n gustong pumasok sa PMMA pumasok na po at mg-enroll. Be sure enough na talagang gusto mong maging graduate ng PMMA and strong enough to face challenges na m encounter nyo. Hindi po katulad ng private school at universities ang papasukan ninyo. Reminder lang po yan sa mga gustong pumasok. Sa mga gusto namang manira s PMMA, go ahead give your best shot….. wala na bang iba yan lang? We will respect your comments good or bad regarding sa PMMA. At pag tapos na kayo sa ginagawa ninyo, try nyo pumasok kahit Probi lang, para lang naman malaman nyo na hindi kami nagpkahirap, nag sakripisyo, nagtiis, at nagtapos sa PMMA para lang baboyin nyo. Mas mainam harapan ninyo sabihin sa isang graduate (hindi sa cadet) ang mga sama ng loob ninyo sa PMMA. Hindi yung sa internet lang kayo bumabanat. Walk the Talk po sana. gud afternoon sir/mam, i want to enroll to your school. that i need to compile..
im very interested to enroll to your school with my friend. im christian yuan nario and 16 yrs old. this is my contact number. Both my son and I, have great interest for him to be a Ship Navigator someday. He is still very young po. Papasok palang po ng highschool by next year. I would like to get some idea po, if which school, a college or university you would best recommend po for him to take his highschool years in prep for PMMA. Im sure you will not endorse any or maybe not through this site. But will greatly appreciate po if you could give us an idea. Please doe reply sir, through my email add migierichgab36@yahoo.com. Thank you evry much, and more power to PMMA!! !